Present state: Station approach road, part of the platforms and footbridge extant. 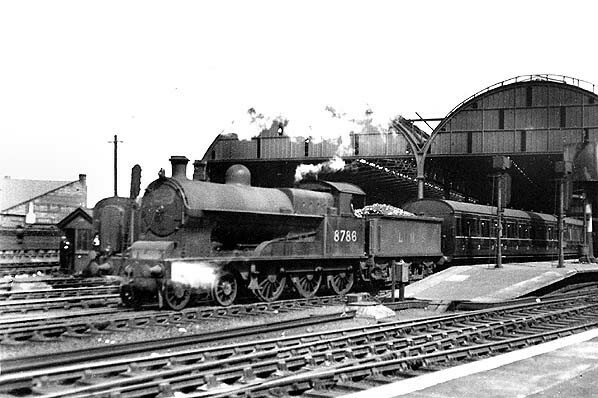 Notes: Manchester Exchange was situated on the London & North Western Railway’s (LNWR) east and west route that connected Liverpool with Leeds. The first section of the route was the historic Liverpool & Manchester Railway (L&MR) which had opened in September 1830. At the time of opening the L&MR had its eastern terminus at Manchester Liverpool Road station but by the 1840s traffic had increased to such a degree that a new station was needed. The initial solution was to build a new section of line, the Hunts Bank Extension, to connect with the Manchester & Leeds Railway (MLR) at their Victoria station. The MLR had agreed to allow the L&MR to use platforms at Victoria. Manchester Liverpool Road station closed on 4 May 1844, and from that date passenger services were extended to Victoria. On 8 August 1845 the L&MR was absorbed into the Grand Junction Railway. A year later, on 16 July 1846, that company, along with a number of others, merged to form the LNWR. On 8 July 1847 the MLR became the Lancashire & Yorkshire Railway (LYR). LNWR was the Huddersfield & Manchester Railway which had begun a trans-Pennine route via Standedge; this would form an alternative to the MLR to Leeds, albeit with the LNWR having to exercise running powers over lines owned by the LYR. When the Huddersfield line opened to goods services in 1850 the LNWR had created its east-to-west trans-Pennine route although, over the following decades, additional lines and connections were created to improve it. It was no surprise that the LYR gave priority to its own services at Manchester Victoria and, even though the station was expanded over the years, by the 1880s it was seriously congested and the LNWR was constantly frustrated. The solution was for the LNWR to seek powers to build its own station. 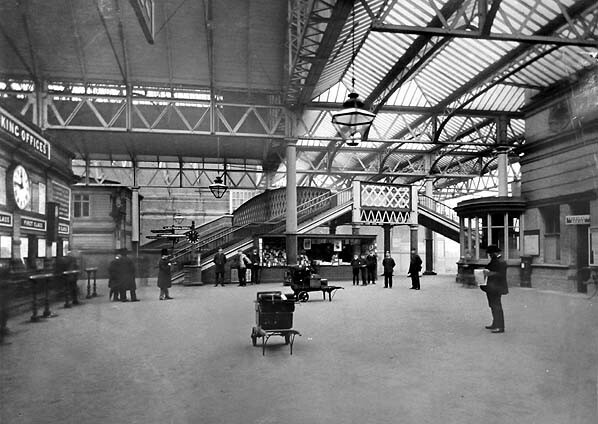 Manchester Exchange station opened partially on 30 June 1884 and fully in July 1885. It was actually located in the city of Salford but only a stone’s throw away from central Manchester from which it was separated by the River Irwell. It lay immediately west of the LYR Manchester Victoria station which was on the other side of the Irwell and therefore within Manchester. Exchange station was elevated above street level being carried on brick arches. It was reached by an approach road from Victoria Street which spanned the River Irwell. Its main entrance was south of the line and consisted of a grand four-storey stone building flanked by other smaller structures. Within the main building were offices and refreshment rooms; cloak rooms, toilets and further offices were in the other buildings. To the east of the imposing frontage building was an access point for road vehicles. The station was provided with a trainshed roof of three arched sections which extended for almost the entire length of the platforms. terminus platforms and three had through lines. The terminus platforms were numbered 1 and 2 and they led out to the west. They were located on the southern side of the site directly beyond the entrance. Adjacent to platform 2, and to the north of it, was platform 3 which was longer than the two terminus platforms. Immediately east of the buffer stops, at the end of the terminus platforms, was the booking office. Platforms 4 and 5 were on a long and wide island platform. A footbridge linked it to the terminus platforms and platform 3, but it also had a cab road that tunnelled under the line at the eastern end of the station and reached the platform by a sloping roadway. At the eastern end of the island platform, adjacent to the footbridge, were a parcels office and a ladies’ waiting room. The LYR main line between Bolton and Leeds passed by the north of Exchange station. At its western end, south of the line, were a turntable and stabling sidings for locomotives. Great Western Railway (GWR) which allowed that company to run services into Manchester Exchange thereby giving the GWR its only access to the city of Manchester. GWR express services reached Exchange via the joint LNWR/GWR line which connected Chester with Warrington; from Warrington they ran over LNWR metals to Exchange. 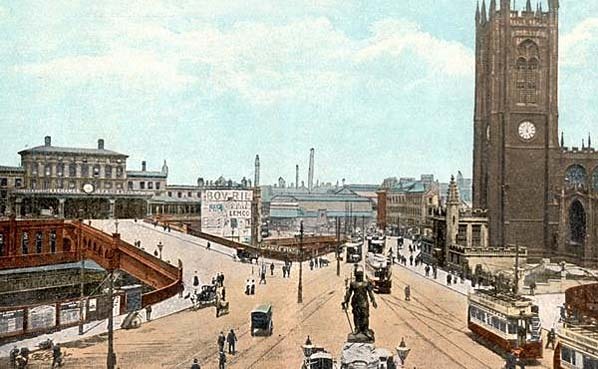 During the latter part of the nineteenth century and into the early part of the twentieth the competition to attract passengers between Liverpool and Manchester was intense. Passengers had four choices: the Cheshire Lines Committee (CLC) between Manchester Central and Liverpool Central; the LYR between Manchester Victoria and Liverpool Exchange; and the LNWR between Manchester Exchange and Liverpool Lime Street and between Manchester London Road and Liverpool Lime Street via Warrington Bank Quay. The first three were the fastest and it was over these that each company introduced hourly express services which completed the journey in just over 40 minutes. The LNWR route from Exchange to Lime Street was the shortest but it faced very stiff competition from the CLC who had a very straight and fast line. The December 1895 Bradshaw timetable listed main line departures from Manchester Exchange to Birmingham, Chester, Glasgow, Holyhead, Huddersfield, Leeds, Liverpool and London. Numerous local services operated including the weekday morning services shown in the table below. On 1 January 1922 the LYR was absored into the LNWR and a year later the LNWR became part of the London Midland & Scottish Railway. In 1929 the LMS combined platform 3 at Manchester Exchange with platform 11 at Manchester Victoria to make a continuous platform of 2235 ft: this was the longest platform in Europe. Its benefit was to offer the LMS operational flexibility so that it could route the most appropriate trains into the more appropriate station. The GWR continued to operate services to Manchester Exchange. 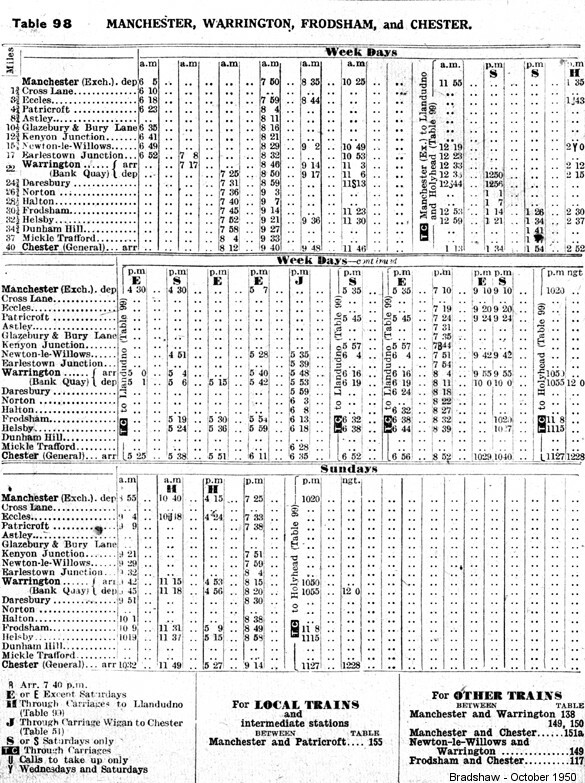 The LMS summer timetable for 1932 showed the following afternoon weekday departures from Manchester Exchange. In December 1940 Manchester Exchange was badly damaged by enemy bombing. The station building was almost completely destroyed, and what was left had to be demolished; it was later replaced with an ugly brick wall frontage. The station was patched up and brought back into use. a new standard of comfort and accelerated timings to the route and proved popular with passengers. The summer 1962 timetable showed seven Trans-Pennine services from Manchester Exchange to Hull and five to Leeds City, all of them having started from Liverpool Lime Street. Eleven of these services ran from Manchester Exchange to Liverpool Lime Street. There were, in addition, many other east - west services such as the Liverpool and Newcastle expresses. Services between North Wales, Chester and Manchester continued to use Exchange as did local trains running between Liverpool and Manchester, either along the original L&MR or via Leigh. continued to pass through the station. 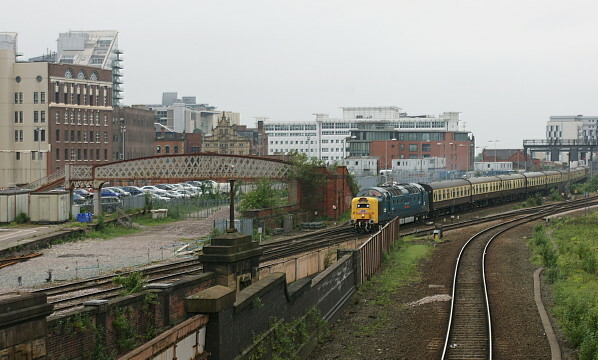 In the early 1980s the trainshed roof was demolished, and in 1993, when Manchester Victoria was substantially altered and all the lines leading to it rationalised, the tracks through Exchange were lifted. In 2012 platforms 3, 4 and 5 still survived as did the station footbridge. It continued to be used as a public car park. In 2015 demolition of the station foundations began. Tickets from Michael Stewart and Bradshaw from Nick Catford. Manchester Exchange in the first decade of the 20th Century looking northwards. The imposing station building seen at the top of the sloping roadway, leading off to the left, was destroyed by a bombing raid in December 1940. Manchester Exchange shown on a 2:1,500 scale map from 1915. 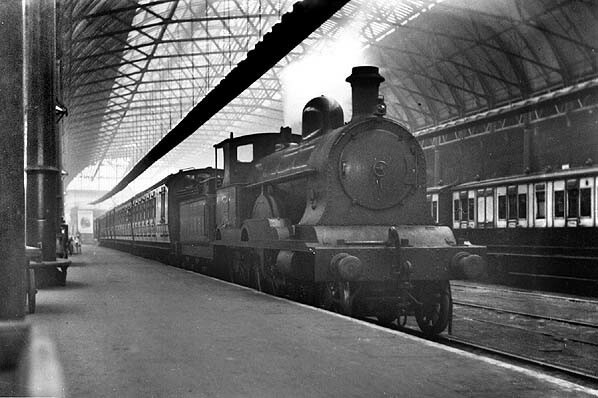 In the early years of the 20th Century a train waits to depart from Manchester Exchange platform 2. This was one of the two west-facing terminus platforms. An early 20th Century view of the circulating area at Manchester Exchange. To the left, behind the booking office, were the two terminus platforms numbers 1 and 2. Straight ahead were through platform 3 and the footbridge that provided a link to the island through platforms 4 and 5. The western end of Manchester Exchange in the 1930s. 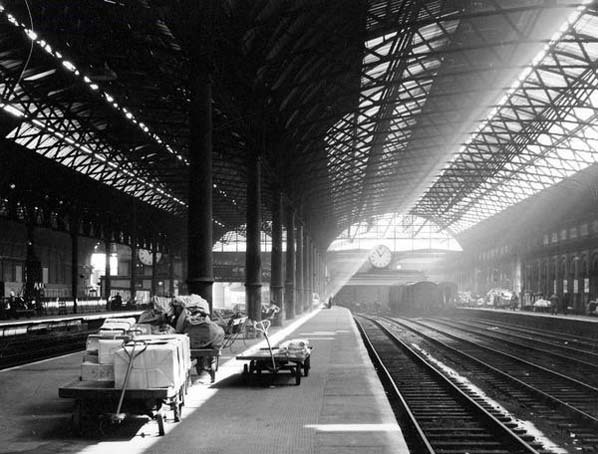 Looking east towards the buffer stops along platform 2 at Manchester Exchange in 1957. The through platforms are to the left. 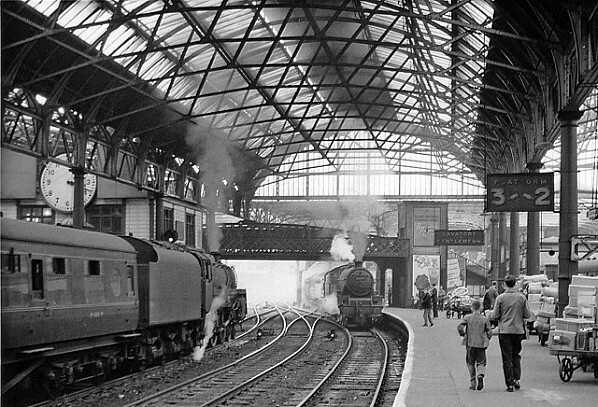 Looking east along platform 3 at Manchester Exchange in 1960. Since 1924 platform 3 had formed a continuous link between Exchange and Manchester Victoria station. It was the longest platform in Great Britain at 2,194ft (0.41 miles). 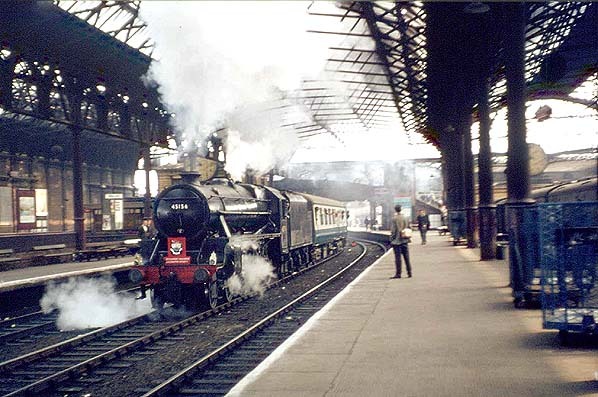 Manchester Exchange station in the summer of 1968 as one of the numerous 'farewell to steam' railtours passes through, heading west. 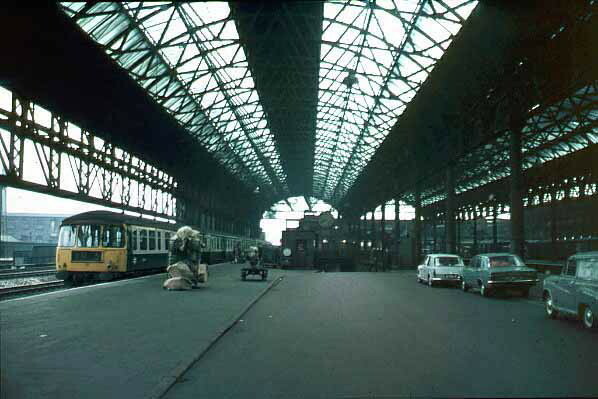 Looking east along platform 5 at Manchester Exchange in May 1969 just before closure. A Trans-Pennine DMU is seen waiting to depart for Liverpool Lime Street. The Trans-Pennine DMUs were introduced onto the Hull, Leeds, Manchester and Liverpool route in 1960. Originally they consisted of six coaches including a buffet car. With four of the six coaches being motorised they were powerful units that brought improved journey times and better comfort to the Trans-Pennine route. Looking west at the site of Manchester Exchange station on 2 June 2012. The footbridge which connected the through line platforms can be seen to the left. The cars seen parked beyond the footbridge occupied the site of the station concourse and the west-facing terminus platforms 1 and 2. Passing the station on the former LYR lines is Deltic locomotive number 55 022 'Royal Scots Grey' on the 'York Flyer' railtour. At the controls was Warrington-based DBS driver John Wilson.